Ultrasound is a method of imaging internal organs that can often assist in the diagnosis of disease. When used in combination with X-Ray, it can often lead to a diagnosis without the need for exploratory surgery. 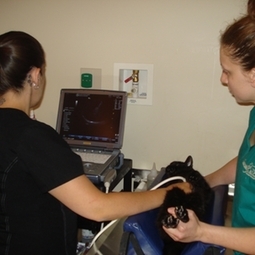 We are proud to boast that our Technician, Sara, is Certified in Veterinary Ultrasound & is highly skilled in assisting the Veterinarians with performing Ultrasounds to help diagnose your pet's condition.